High school and college students alike are often asked to write essays in school, and some end up searching online for personal narrative examples to help them write it. Simply put, a personal narrative is a story in which the writer tells a story about a personal experience. It could be about an exciting, scary, or tragic time in your life, but a narrative will always have certain characteristics. Facts and Emotions – Personal narratives have so much more depth than a research paper. They include the facts of what happened as well as the emotions that came about as a result of the events. Narratives are aimed at making the reader feel that they are there in the story, watching it unfold. Give it emotion and draw them in. Tell It as It Happened – Most narratives also tell the story as it happened in time — in chronological order. Sometimes a story will start at the ending and go back to the beginning to tell how the ending came about. However, only skilled narrators should attempt this, as the reader could become easily confused. Write your personal narrative in the order it unfolded to keep your story simple and poetically moving. Write In the First Person – A personal narrative is just that — personal. Therefore, it must be written in the first person. This means using words such as “I” and “me” and “myself.” You want to tell the story as it happened to YOU, from your perspective, not from the perspective of someone looking in at the event happening to you. Show, Don’t Tell What Happened – One of the simplest ways to bring someone into the story is to use describing words that show what is occurring. This is easily accomplished by thinking about the five senses as you write. What were you smelling, touching, or hearing as this particular event unfolded? Describe these senses in your writing. When searching for personal narrative examples, look for stories that include facts as well as raw emotional and feeling. The story should be told in chronological order, and should be told from the angle of the writer — in the first person. 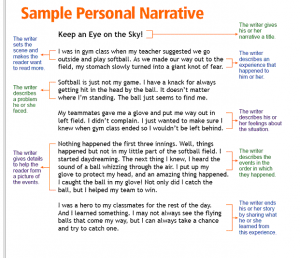 Following the formula of other’s personal narratives will help any high school or college age student craft a moving story of their own. This entry was posted in Writing and Speaking on December 10, 2013 by admin_z.